When you climb Kilimanjaro, one cannot but think that to move Africa's highest mountain to the Indian Ocean 200 km to the east, would take faith somewhat bigger than a mustard seed. And getting to the top, requires faith of another sort: faith in your own abilities, constant belief that this daunting volcano would not get the better of you. Without that belief, don't even walk through the gate at Machame where our journey started on 16 October 2005. 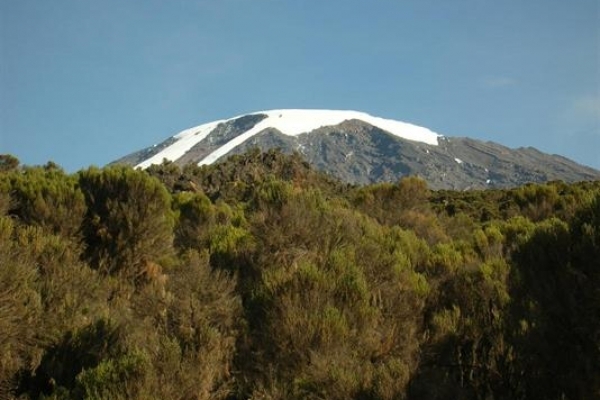 Kilimanjaro is one of Africa's volcanoes spread along the rim of the Great Rift Wall Valley. It has not been active for hundreds of years although at Reusch Crater and the Ash Pit at the top steam still slowly escapes fro the innards of the Earth, showing that this giant is far from being totally dormant. 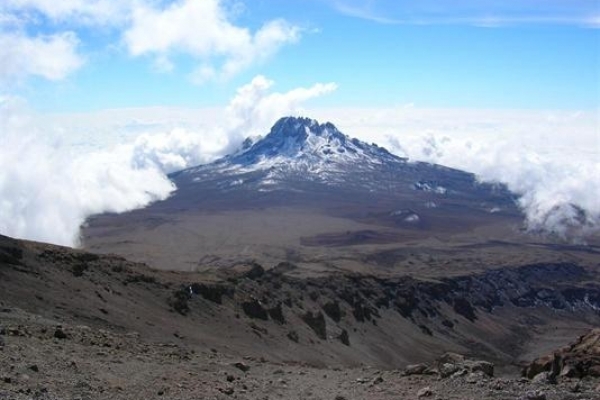 You can climb Kilimanjaro in various ways and along various routes. You can be totally unaware of the magnitude of the age of the mountain, ignorant of the fascinating way in which volcanoes come about. Most climbers probably see it as a big chunk of Earth standing in their way, without knowing anything about tectonic plate movement and without noticing the countless number of lava formations along the path to the top. 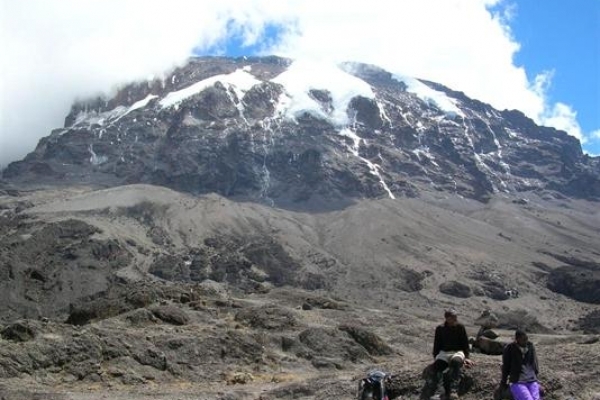 A good preparation to understand the mountain which will occupy your thoughts for at least six days while you follow the Machame route, is to read a good book on the Earth's geological history. An excellent one is Richard Fortey's The Earth, An Intimate History. Our climb was arranged by Wild Frontiers, an excellent tour operator whose preclimb information and knowledge of the mountain make you feel that you are in safe hands. But give attention to their notes and warnings. Make sure that you are properly prepared to get to the top, whether it is by following the tips they send you months before the summit, or by going through a rigorous training programme that will make your journey to the top so much easier. There is a rumour everyone climbing the mountain talks about, that quite often fit people, athletes and other outdoor folk, tend not to always reach the top. There is a logical explanation for that: they overestimate their fitness in relation to the 5 896 meters they have to conquer. Subsequently they ignore the one basic rule of the mountain: pole pole, take it slowly, don't rush, even if you feel wonderful. They don't listen to their guides and forget that acclimatisation to the heights is one of the cardinal rules to adhere to, because it takes time for your body to adapt to the rarified air and lack of oxygen. This is often the easiest day on the mountain. 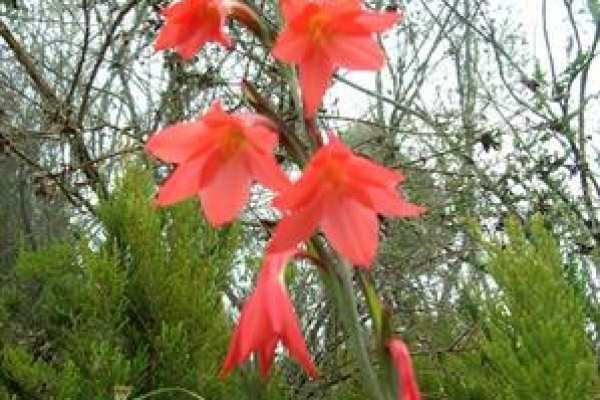 The route from Machame gate to Machame camp takes one through the rain forest where the bird life is exquisite. Take along a bird book on East African birds and don't rush it: stop to look and listen. Machame is reached after the rain forest suddenly falls away to make way for mixed bushes and smaller trees. It is a stiff climb, this first day, but not overwhelmingly so. When you reach the comfort of your camp, the mountain's glaciers are clearly visible, your first close view of this magnificent volcano. 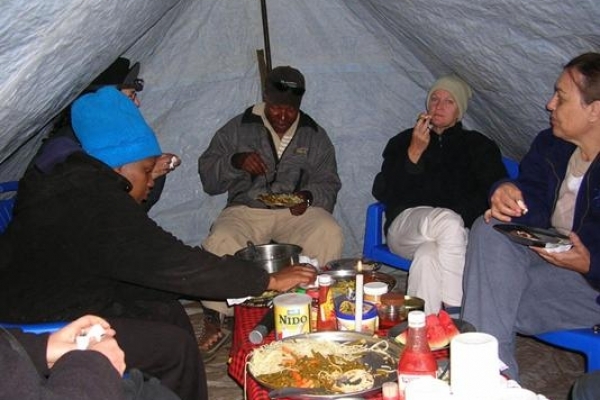 Machame camp is 3000 m high, and where you started the day, the gate was only 1 500 m, a good opening salvo in your battle against the odds of gravity and atmospheric limitations. The tents we stayed in, pitched and ready when you arrive at the camp, are comfortable and convenient. But right through the climb, I resented that I did not properly stick to the requirement that less is better with regard to what you take up in your baggage and rucksack. The porters carry your belongings up to the camp each day, and one tends to take far too much weight. Before departing from the Keys hotel in Moshe, the baggage is weighed and anything above 15 kg must be taken out and left at the hotel. Also make sure that the rucksack you carry only has the minimum necessities. Enough energy snacks for one, enough water also. Remember, you must carry it up the mountain and a lighter weight is to your advantage. Good advice: be fair to the porters who have to take your stuff nearly to the top. The more you take along, the less space you'll have in your tent, shared with one other climber. Already on day one you should have taken to heart the two basic rules of the mountain: take it slowly (pole pole as the Swahili guides constantly remind you), and drink lots of water. Leaving Machame camp early, one is immediately confronted with the reality of gravity: lying ahead is a very stiff, winding path that climbs more than 800 meter to Shira camp, a long walk of nearly 8 hours. Reaching the plateau after about 5 hours, here one can rest amidst a host of large black ravens, the last time you would see significant bird life until you re-enter the rain forest on your way down on the last day. Shira lies on a desolate plain. Here you first become aware that Kilimanjaro is in fact not one mountain, but three. To the west of Shira lies the ragged peaks of the Shira ridge. 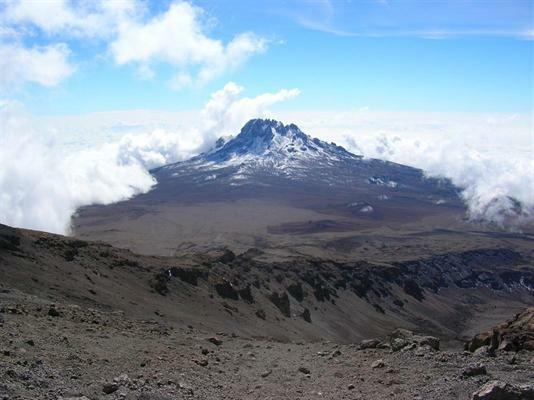 In the middle, towering above you, is Kibo, the large crater-like volcano usually wrongly thought to be Kilimanjaro. 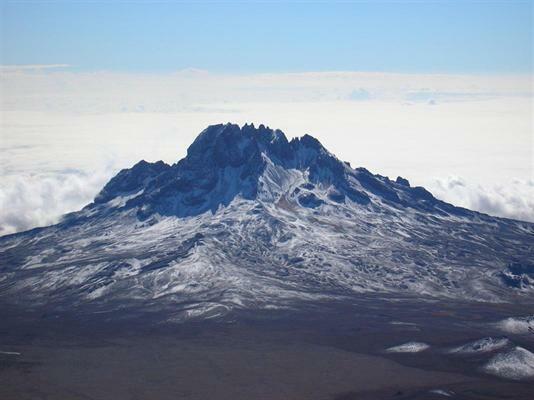 And to the east is Mawenzi, a magnificent mountain with jagged peaks looking like the teeth of an old witch. 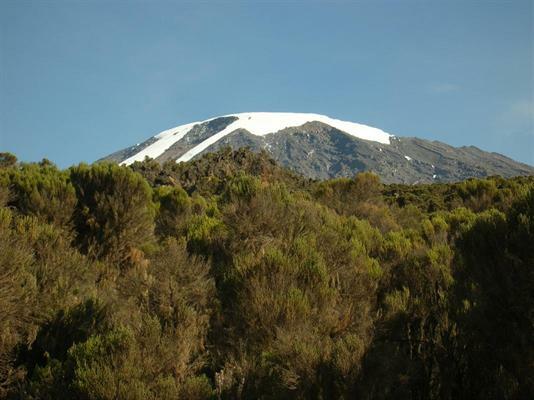 Kilimanjaro consists of Shira (with its highest part at Johnsell Point, 3 962 meter high), Kibo (with Uhuru Peak at 5 896 meter), and Mawenzi (with Hans Meyer Peak at 5 149 meter). This is long day, taking you through mixed landscape past some of the most spectacular lava formations on the mountain. One climbs to more than 4 600 meter and has a wonderful view of the Lava Tower, a significant example of the power of what forces are released when a volcano blows its top. 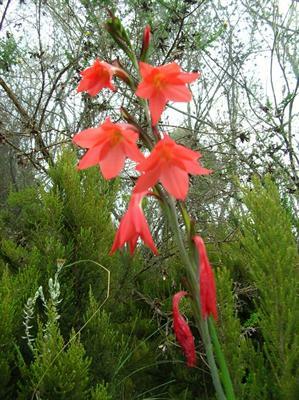 And then it goes down all the way through a valley along the Umbwe Route, with typical endemic plant species, of which the Lobelia deckenii (up to 3 meter in height) and the Senecio Kilimanjari (up to 5 meter) are the best examples. 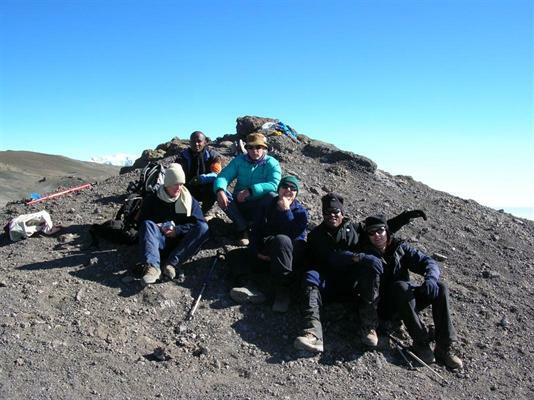 You reach the Barranco Camp at 3950 meter by late afternoon. 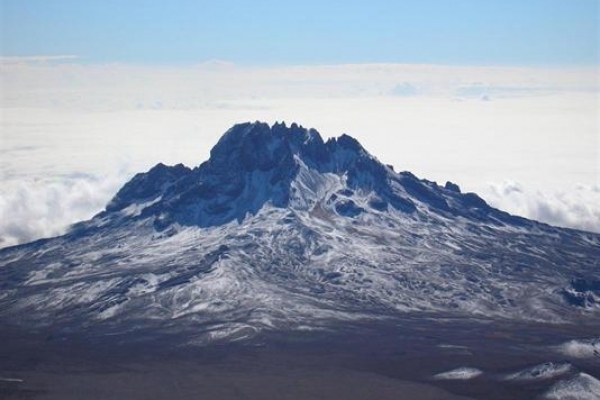 Barranco lies south-southwest of Kibo, with the mountain towering above you. Here you really wonder about your ability to scale this fortress as the Barranco Wall lies in wait for you early tomorrow. 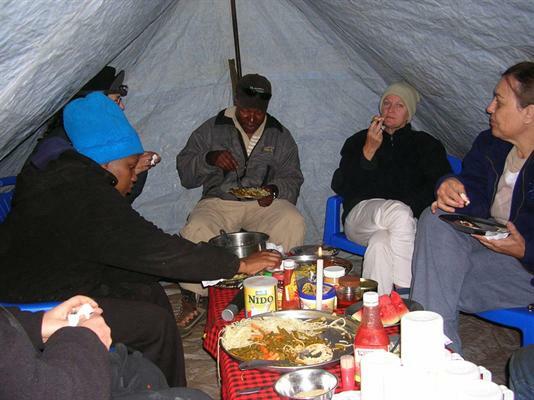 This is the longest day, starting at daybreak and ending with you waiting to be woken for the final ascent about 18 hours later at Barafu Camp (4 600 meter). The Barranco Wall is a terrible climb, often with hands and feet over a sheer cliff, but once you are over it, you have spectacular views of Kibo, if the weather allows it. This is one facet that makes the way up Kilimanjaro so unpredictable - the weather changes all the time. 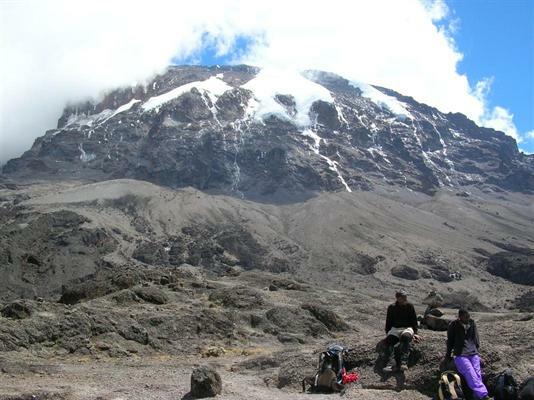 When we reached Karanga Camp where we had lunch at a height of 3 963 meters, the sun was shining and quite warm. An hour later the most difficult part of the climb began for me as it started raining. Then you suddenly remember why Wild Frontiers emphasised so much that your clothing should include waterproof attire. Don't leave your home without that! To get wet on the mountain, is not fun as the cold only then succeeds in getting into your bones. From Karanga to Barafu you move through landscape that could have been on the moon. We saw the full moon rising over Kibo on the first evening at Machame camp. These plantless and rocky surroundings remind you of the surface of the moon. One goes to bed early in Barafu. And at 23:30 you are woken to start the final ascent. We listened in somber mood as it started raining on our tent two hours before midnight. We were wrong. When we left our tent before midnight to begin the last climb, the surroundings were covered in snow. Mawenzi's face was white in the bright moonlight. 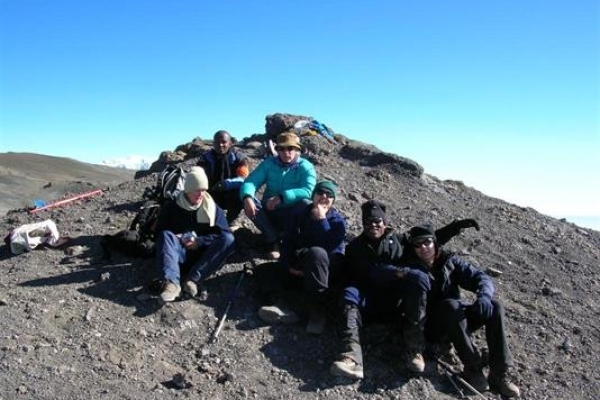 Barafu is only 1 200 meter below Uhuru Peak, with a magnificent view of Mawenzi to the east. Mawenzi will haunt you the following hours, as you will always see it to your right while slowly ascending the final 1 200 meter. And for a long time it is still higher than you, you knowing full well you will only be at the top when Mawenzi is 700 meter below you! The final ascent starts before midnight and we only reached the top at 07:15. This is an endurance test that will tap your resolve, your strength, and every last bit of calorie left in your veins, organs and muscles. I was glad I became fitness-wise properly prepared, but I did not prepare myself mentally for the sheer magnitude of that last stiff climb to Stella Point. Kilimanjaro is a mental challenge that makes the Comrades marathon diminish in stature. But if you take it slowly, the hours tick by and will bring you to the top. It is worth every breath and bit of pain. The lack of oxygen is the one factor holding you back now and I counted that on the last 800 meter I could only walk 40 steps at a time before I had to rest. The exhilaration when you see the Reusch Crater below you, the white-green glaciers below and not above you anymore, gives you new life. After two hours at the top, we started the descent. We reached Barafu two hours later, and from there on moved on to Millennium Camp as the weather started to deteriorate rapidly and we could not sleep at Barafu again. Now it is downhill all the way. But don't let that fool you. Tired legs don't like the hammering when you descend. But when you reach the rain forest, you know you are nearly there. Through Mekwa Camp first, and then into the forest with its chattering birds and monkeys. Do it! It enriches your spirit. Take the medicines you need to, if necessary. I never took the altitude medicines we brought along, but only because I never felt ill. If your guide advises you to take them, listen to him. Always listen to your body. Don't rush it up the mountain, even if you feel very well. Pole poleare the watchwords towards success. Take enough warm clothes, preferably warm underwear. Believe in yourself. That belief is made so much easier if you prepare yourself. Drink lots of water, liquids (not alcohol). The reason climbing Kilimanjaro is not cheap, is due to the fact that the mountain is part of Kilimanjaro National Park who charges $30 (US) per day on the mountain. All your food is carried up the mountain and the price of your package includes everything. You need visas and yellow fever inocculations for Tanzania. Should you require more information, contact us at Neelsie Travel at 021-8839898. George Claassen is a South African science journalist.